…suddenly right in front of our boat the water exploded up and an enormous whiskered face launched up out of the water. He was so close that he put a front flipper up against the kayak and I could smell his breath. Walrus are HUGE, and those tusks are not small either! He dipped back under the water and I thought he was going to come up from under us and try tip us over. 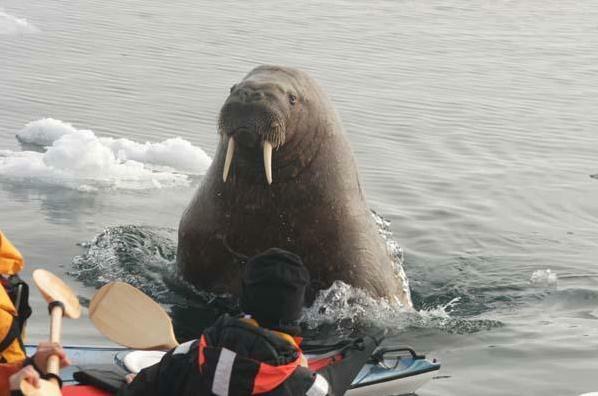 This is an old blog post, from 2005, but the picture gives a great idea of how large a walrus is compared to a low-riding sea kayak. This encounter must have been frightening indeed. Never Mind The Polar Bears, Beware of the Walrus! Thats me in the photo with the black hat. I still consider it one of the defining moments of my life. Well, thanks for the comment, Carl – I had run across this photo in one of my many Google picture searches for “walrus” and was happy to run across your blog post that gave it some context. I’ve got touring kayak experience as well, and I know the sensation of sitting low in the water – which just emphasizes how HUGE that walrus must have seemed. Half of me would have LOVED to have been there – half of me is glad it was you! Thanks again for the comment.